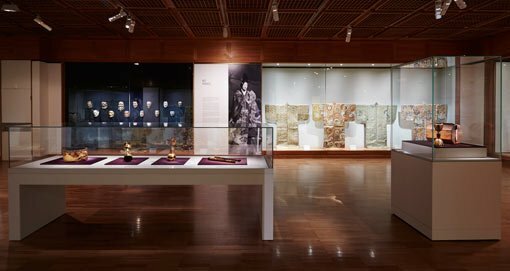 For the past few Wednesdays in the exhibition Theatre of dreams, theatre of play: nō and kyōgen in Japan , Gallery staff have picked their favourite artworks to share with visitors. Director Michael Brand focused on the austere rōjo or old woman mask, which in its balance between the abstract and the figurative calls to mind a Brancusi sculpture. Because it’s been mounted in a perspex box, we can see the back of the mask and its inscription, which tells us who made it for whom, and we get a sense of what the actor who wore it might see through the small apertures in the eyes, nose and mouth. The quirkiest staff pick has been from curator of Asian art Natalie Seiz who had us look at a kyōgen mask of a man with very sharp teeth. It turned out on close inspection to be a mask of a fox disguised as a man. In the humorous play where it appears, a centenarian fox has lost all his relatives to a trapper. He transforms himself into the trapper’s uncle, a priest, to persuade the trapper to desist from his evil ways. 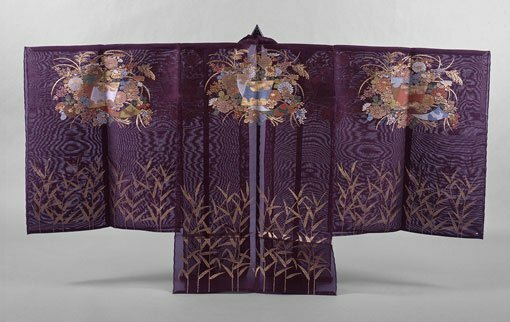 You and I might not have noticed but exhibition curator Khanh Trinh drew our attention to the motif of irises and plank bridges shared by both the lacquer body of a drum and an intricately woven karaori robe. The theme derives from an episode in the 10th-century literary classic, The tales of Ise (Ise monogatari) . This Wednesday I’ll focus on the gorgeous garments known as chōken, which are worn for dance sequences in nō plays. The diaphanous silk gauze weave with motifs outlined in gold creates a refined elegance approriate for aristocrats and celestial beings. It’s also very appropriate for our fashion-themed Art After Hours, with designer Alistair Trung speaking about how the Japanese fashion aesthetic has influenced many of his garments when it comes to form and style, and a chance to make your own origami jewellery under the instruction of artist Midori Furze while sipping a Japanese beer or cocktail from our pop-up bar, now run by Matt Moran’s MorSul catering team. Next post: Is this your first time?